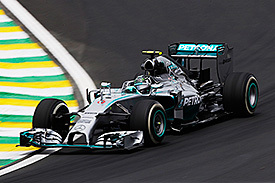 12:43 Welcome to AUTOSPORT's live coverage of final practice and qualifying for this weekend's Brazilian Grand Prix at Interlagos. 12:46 The verdict from our team of journalists in the paddock is that while it's cloudy at Interlagos at the moment, rain doesn't appear likely for the time being. 12:46 There is a 30 per cent chance of rain during the session, though. 12:48 The new track surface here was a big talking point during Friday, and the oily make-up of the asphalt combined with high temperatures made a big difference through the day. 12:49 However, F1 tyre supplier Pirelli believes that the surface will become more of a worry if we do get some rain this weekend. "With rain, when we've got these oils coming out of the new bitumen - oil and water - you don't need to be an expert to know that that is not a great combination," said Pirelli motorsport director Paul Hembery. "So if it does rain we have to urge great caution. The racing line is different in the rain compared to the dry, so drivers will be going over parts of the track that were not run over [on Friday]." 12:54 While the world championship cannot be decided this weekend (thank you, Abu Dhabi double points...), there's still plenty of attention on the Mercedes drivers. Our experts GARY ANDERSON and EDD STRAW analysed yesterday's running in-depth, and they explained why it was Nico Rosberg's best Friday of 2014. 12:55 @pirellisport: "FP3 coming right up. Cooler today but overnight rain has washed much of the rubber laid down yesterday off the track. Will be interesting to see if that makes the track more slippery. Generally grip has been higher than expected on new surface (like Sochi)." 13:00 Both the Lotuses and Bottas kick things off by heading out first. 13:01 Massa is also out. 13:02 As you would expect, everyone who has gone out so far is using the medium-compound Pirellis. The qualifying simulation runs on the quicker soft rubber will come later. 13:04 So far we've seen Maldonado, Grosjean, Bottas, Raikkonen, Massa, Alonso, Rosberg, Hamilton, Perez, Vergne and Gutierrez. 13:08 So far, the only cars we haven't seen are the Red Bulls and the McLarens. 13:08 Grosjean is told: "From other people's laptimes, the track looks to be in reasonable condition." 13:09 There are quite a few dusty patches on the track, showing that overnight rain has undone a lot of yesterday's work from the drivers to clean it up. 13:09 Hulkenberg is complaining of "brake chatter". 13:10 Hamilton is warned to take "caution on the exit kerb of Turn 12 [Juncao], it's still wet". 13:10 Nine drivers have set times now. Vergne leads the way from Kvyat, Grosjean, Sutil, Perez. 13:13 Vergne re-takes P1 by about one tenth - and he is quickly replaced by Magnussen on a 1m13.016s. 13:14 Ricciardo is the only driver not to have left the pits yet. 13:14 Still waiting on times from Bottas, Raikkonen, Massa, Alonso, Ricciardo. Bottas is on course for P1 as we speak. 13:15 Bottas is the first driver under 1m13s today - he takes P1 with a 1m12.892s. 13:15 Lots of changes at the top of the order. Vergne, Button, Magnussen is the new order behind Bottas in P1. 13:16 Magnussen knocks Bottas off of top spot - 1m12.729s. 13:16 Bottas has set a new overall best in the first sector. 13:17 Hamilton has a big lock-up. The tyre looks pretty second-hand after that. 13:17 Bottas goes fastest again - this time by six tenths - with a 1m12.097s. 13:17 More trouble for Hamilton. He's had a spin at Turn 1, locking the rears. 13:18 Hamilton is asked if his tyres are still in good condition. "No" is the straightforward response. 13:19 Massa makes it a Williams 1-2 at the top, taking P1 from Bottas by 0.027s. 13:20 Massa and Bottas are trading 'purple' (fastest) sector times out there at the moment. 13:21 Vergne has an off, but gets going again without problem. 13:21 Massa sets the first sub 1m12s lap of the day - 1m11.559s to extend his lead at the top of the order. 13:22 Raikkonen splits the Williams drivers, taking second with a 1m11.946s. 13:23 Alonso slots into P5, while Massa is on course to set a new benchmark. 13:23 Massa misses out by 0.069s on setting a new fastest time. 13:25 Alonso and Ricciardo (who has gone fifth) are the only cars on track at the moment, as Massa heads back out. 13:26 We're yet to see much in the way of times from the Mercedes drivers yet. Rosberg is 16th, Hamilton 18th. 13:27 Ricciardo has the track to himself at the moment. He's up to fourth. 13:29 Perez is the first driver to head out on the faster soft-compound Pirellis, closely followed by Lotus driver Pastor Maldonado. 13:29 Grosjean and Vergne have also headed out on softs, so expect improvements from them soon. 13:29 We've reached the halfway point, so it will be qualifying simulation time soon. 13:30 Rosberg complains over the radio about a vibration on from the right-front. He says it's a flat-spot. 13:31 "Biggest problem is losing the rear while braking," says Ricciardo over the radio. 13:31 Maldonado goes fourth, having switched to the soft tyre. 13:32 Fellow 'soft' runners Grosjean and Vergne take sixth and eighth, while Perez is only 15th, also on a set of softs. 13:33 Bottas - still on mediums, moves up to fourth with a slightly scruffy lap. 13:35 Rosberg has rejoined the action and he's into the top 10. The track is getting busier now, but there's still no sign of Hamilton, who sits at the bottom of the times with 11 laps and a spin at Turn 1 to his name. 13:37 A medium-tyre lap from Vettel moves him up to 11th, while Bottas improves to move second behind team-mate Massa. 13:37 Raikkonen and Ricciardo follow the Williams drivers, and Button has just moved up to fifth behind them. 13:39 Massa - still running on mediums - is going even faster. 13:40 A couple of small lock-ups for Massa and he's lost a bit of time, so he falls short of his previous best by half a second. 13:43 Alonso goes fastest on a set of softs, by 0.160s from Massa. The tyres made the difference in the middle sector, where the Ferrari was fastest overall. 13:43 Vettel runs a little wide at turn four. 13:44 "Brakes are much better," says Hulkenberg. 13:45 Rosberg is on an outlap, warming up for a soft-tyre flying lap. 13:45 We're now seeing a lot more cars out on softs - Rosberg and Raikkonen among them. 13:45 Rosberg is 0.2s up on Alonso in sector one. 13:46 The advantage is 0.7s on Alonso by the end of sector 2. 13:46 Rosberg goes fastest by 0.9s with a 1m10.448s on soft tyres. 13:47 Raikkonen takes second - 0.870s behind Rosberg. 13:47 12 minutes to go and it's well and truly soft-tyre time as more cars join the action. 13:48 Ricciardo takes second, 0.7s adrift of Rosberg's best. 13:48 While everybody else gets down to work, Alonso, with 8 laps to his name, is already back into jeans and a T-shirt in the garage. 13:48 "The track is getting better and better" reports Hulkenberg. 13:49 Hamilton beats Rosberg's best in sector 1, and further round the lap the German backs out of his latest lap after making a mistake. 13:49 Hamilton is 0.053s down on Rosberg by the middle sector, and he slots into second, 0.114s slower by the end of the lap. 13:50 Ricciardo backs off towards the end of sector two on his latest lap. 13:52 Bottas slots into third, 0.6s behind Rosberg. 13:52 Massa beats his team-mate to take third, and he's two tenths faster than the Finn. That gets him inside half a second of Rosberg. 13:53 With those laps, Williams has established itself firmly as best of the rest behind Mercedes again. 13:54 Rosberg is on another hot lap - fastest of anyone in sector one. 13:54 Hamilton, meanwhile, has his progress slowed by a Lotus. 13:55 Rosberg doesn't improve, as he follows a Toro Rosso across the line. 13:55 Massa runs wide at turn four. Gets going again easily enough but that lap is done. 13:55 With four minutes to go, Hamilton is in the pits. Scratch that, he's back on track now. 13:56 Vettel's latest soft-tyre effort is only good enough for 12th. Red Bull team-mate Ricciardo sits fifth, one second faster. 13:57 Hamilton starts another quick lap, and he's faster than Rosberg in sector one. 13:57 Massa is unhappy with Perez. He locks up while trying to pass the slow-moving Force India. 13:58 Hamilton has a scrappy middle sector, and he aborts the lap. 13:59 Lots of cars returning to the pits before the chequered flag comes out. 13:59 Vettel has found two tenths, moving from P12 to P11. 14:00 Both Force Indias are in the pits - and they prop up the order in this session. 14:00 That's it, the session fizzles out a bit. 14:33 While teams are anxiously watching the sky and making their final set-up preparations for qualifying, financial arguments are rumbling on in the paddock. We'll be back to see what the weather holds for qualifying and to take you through every moment of the session just before 4pm UK time. See you then. 15:53 Here we go then, just a few minutes until Q1 kicks off in Brazilian GP qualifying. 15:54 The latest on the all-important weather: Risk of rain is up to 40% now (from 30% this morning. Track temperature is 39C; Air temperature is 24C. 15:55 As was the case at Austin - with just 18 cars here this weekend the qualifying format is tweaked. We'll lose four cars in Q1, then another four in Q2, leaving us with the traditional top 10 shootout in Q3. 15:58 So far this weekend Nico Rosberg has seemed to have the edge over Lewis Hamilton - leading the way in all three free practice sessions. But that's not the first time the German has appeared to be the favourite over the course of a race weekend, and Hamilton's current run of form shows he is more than capable of overturning the balance when it matters. 16:00 The green light comes on to begin qualifying. No takers yet. 16:01 Adrian Sutil's Sauber gets us rolling with just under 17 minutes on the clock. 16:01 Both Saubers are out, with Esteban Gutierrez hitting the track too. 16:02 First frontrunner on the circuit is Daniel Ricciardo in the Red Bull. 16:02 Daniil Kvyat joins the fray for Toro Rosso. 16:02 Ricciardo is told "the wind looks quite still. Low wind". 16:04 First time in is a 1m13.401s from Sutil. 16:04 Gutierrez beats team-mate Sutil by two and a half tenths. 16:04 Ricciardo comes through to go quickest, but his 1m12.825s is only 0.341s up on Gutierrez. 16:05 Now it's Kvyat on top - three tenths faster than Ricciardo. 16:05 Jean-Eric Vergne beats team-mate Kvyat by just 0.002s to go quickest on a 1m12.553s. 16:05 Everyone is now on track bar Kimi Raikkonen and Sebastian Vettel. 16:06 Nico Hulkenberg puts Force India fastest, 0.062s up on Vergne. 16:06 Valtteri Bottas blows all the earlier times away with a 1m11.834s, six tenths clear in the Williams. 16:06 Hamilton has a lot of traffic to pick his way through. 16:07 Hamilton still manages a 1m11.223s, which puts him fastest for now. 16:07 The slower cars did their best to get out of Hamilton's way in the twisty middle sector, but there's not always an easy way for them to move aside. 16:07 Massa grabbed first place for a moment between Bottas and Hamilton's tenures there. 16:07 Now it's Nico Rosberg comfortably fastest, a 1m10.693s lap puts him nearly six tenths ahead of Hamilton. 16:08 Kevin Magnussen goes fifth in the McLaren. 16:08 Hulkenberg improves his time to reclaim fifth from Magnussen. 16:09 Hamilton is on another quick lap now and is up in the first sector. 16:09 Alonso - who has just been passed by a Lotus into Turn 1 - (which then goes off and ruins his lap) - starts a very agitated radio message with a furious "Ay ay ay ay ay ay ay!!" before complaining about a lack of power. 16:09 Hamilton goes quickest, a 1m10.457s puts him 0.236s ahead of Rosberg. 16:10 Alonso now puts in a smoother lap to go third. 16:10 Rosberg responds to Hamilton with a 1m10.347s and is back on top. 16:11 Although Vettel is yet to do a flying lap, he is now on track. 16:12 Button has spent his entire outlap trying to find a way past a Lotus, and he has to back off before Juncao to create a gap. 16:12 Ricciardo says on the radio that the track is dirty, and that should be taken into consideration regarding his feedback on the car's balance. 16:12 A slight improvement from Raikkonen brings his Ferrari up to sixth. 16:13 Button leaps up from 17th to third with his first proper lap. He's seven tenths off pacesetter Rosberg. 16:13 Vettel, who is coasting around at the moment, is talking about "Charge 5" and "Charge 6" on the radio. 16:13 In a good minute for McLaren, Magnussen improves to fourth. 16:14 Sutil makes Sauber's bid for a Q1 escape by going 10th. 16:14 Magnussen is told on the radio: "Kevin, we think that's safe, so box this lap." 16:15 Gutierrez really does take a shot at mid-qualifying glory by going up to fifth place. 16:15 In the drop zone with three minutes left are the Lotus duo, Vergne and Vettel. 16:15 Vettel gets up to 12th, but that's not a comfortable position. 16:15 Ricciardo is temporarily in the drop zone, but he jumps to ninth. That puts Perez out. 16:16 Vergne improves but insufficiently - he's still only 15th. 16:16 Vergne had a bit of a slide on the exit of Mergulho. 16:16 Current top four Rosberg, Hamilton, Button and Magnussen, plus Alonso in seventh, reckon they're safe. The rest are on track. 16:17 Not looking good for Vergne after that error-spoiled lap, his next one is slower and he might run out of time. 16:17 Vergne makes it past the flag in time for one last attempt. 16:17 Perez doesn't gain anything and stays 16th. He's got time for one more lap. 16:18 Alonso is now out for a lap just in case. 16:18 Hulkenberg is in the pits and is 12th. Vettel can't improve from 13th right now. 16:18 Grosjean finds time but can't get out of the drop zone, he's 15th. 16:18 Massa and Bottas pop the Williams up to third and fourth. 16:18 Maldonado cannot improve and stays 18th. Perez isn't doing much on his lap either. 16:20 Vergne on the radio: "Sorry, but the car was undriveable. Sorry..."
16:20 Only two tenths between Q1 escapee Hulkenberg and eliminated Perez, but six tenths split Kvyat in eighth and Vergne in 16th. 16:21 Rosberg remains unbeaten this weekend now he's led Q1 as well. The gap between the Mercedes this time was 0.110s. 16:22 While a miserable Grosjean takes his time getting out of the car at the FIA weighbridge, Vergne jumps straight out of the Toro Rosso and starts talking with his engineers - one of whom is talking him through a piece of paper straight away. 16:25 Q2 gets going, 15 minutes to knock out four more cars. 16:25 First out this time is Hulkenberg. 16:25 Gutierrez is also making an early run. 16:26 Of note - Gutierrez is not wearing the glasses that sparked so much conversation at recent races. 16:26 Both Saubers are out. 16:27 First frontrunner going for a lap this time is Alonso. 16:27 Hamilton is now on track as well, as is Raikkonen. 16:28 Hulkenberg does a 1m12.306s, which is half a second off his Q1 best. 16:28 Sauber clocks in 0.025s down on Hulkenberg. 16:28 Hulkenberg struggled to find an apex on more than one occasion on that lap. 16:28 Sutil goes off for a trip through the grass at Juncao. 16:29 Replays show the rear got away from Sutil while he was turning into the tight left-hander towards the end of the lap. 16:29 Alonso locks up at Bico de Pato and runs wide, ruining that lap. 16:30 Alonso is only third after that messy lap. 16:31 More dramas for Alonso at Bico de Pato, he has to catch a big slide at the rear this time, but it's not as costly as last time. 16:31 Mercedes shows its hand with a 1m10.303s for Rosberg and a 1m10.712s for Hamilton - over four tenths between them. 16:31 Raikkonen goes third, with Alonso fourth when he hooks up a clean lap. 16:31 Massa goes third for Williams. 16:32 Rosberg: "Now too much rear overheating, using the rears too much." 16:33 Bottas takes third from team-mate Massa, within 0.046s of Hamilton's second place. 16:33 Button and Vettel slot into fifth and sixth ahead of the Ferraris. 16:33 Yet to see times from Sutil, Kvyat and Ricciardo. Gutierrez is slowest of those who've done a flying lap. 16:34 Magnussen goes sixth, a tenth behind team-mate Button. 16:34 JONATHAN NOBLE: "Latest detailed weather forecast suggests there is no significant chance of rain yet. There are only a few light showers to the south east of the circuit." 16:36 Button told on the radio: "Still P5, we're pretty confident that'll be safe. We'll turn the car around so we're ready to go just in case." The McLaren driver is 0.8s off of the pace set by Rosberg. 16:37 With three minutes left, the Ferraris and Hulkenberg set off again. 16:38 Hulkenberg has already suffered a couple of lock-ups on his latest lap. 16:38 Ricciardo goes out for what will be his first Q2 flying lap. 16:39 Raikkonen and Alonso go sixth and eighth, with Hulkenberg 10th. 16:39 Kvyat isn't going to run in this session so will be 14th. He still has part of an engine penalty from Austin to take anyway. 16:40 Massa sets the fastest first sector time of anyone so far. 16:40 The Russian is out of the car and stood in the garage with his mechanics, getting a pat on the back. 16:40 Gutierrez improves to 10th and knocks Hulkenberg out, as the chequered flag flies. 16:40 Gutierrez gets knocked out again as Ricciardo improves. 16:41 Alonso was pushed down to 10th, but the only man on a quick lap behind him still was Sutil, and he stayed 13th. 16:41 Massa stayed on the pace and split the Mercedes - he was just 0.04s down on Rosberg. 16:42 Gutierrez has missed the cut, but he is told on the radio that his P11 is "a good effort". 16:42 McLaren's confidence in Button's time being good enough proved spot on. He didn't even lose a place from the moment the team declared he was safe. 16:43 Gutierrez is a happy man - he gives a celebratory fist-pump to the camera as he walks out of the Sauber garage to get weighed. 16:46 Massa's performance in Q2 has got the Brazilian fans excited as anticipation builds for the decisive Q3. 16:48 The light comes on to begin the 12-minute pole shootout. 16:49 Championship leader Hamilton is the first man on track. 16:50 Rosberg is next out. Still no movement from the other eight. 16:51 Bottas, Button and Ricciardo are out too as the Mercedes start their flying laps. 16:51 Rosberg is the quicker man in sector one. 16:52 Hamilton completes a lap of 1m10.195s. 16:52 Rosberg is faster in sector two too. 16:52 Rosberg takes provisional pole from Hamilton by 0.029s. 16:52 Everyone is on track except the Ferraris now. 16:52 Bottas has a twitch in the Senna S at the start of his lap. 16:53 More drama for Bottas, he locks up twice in the middle sector. 16:53 Bottas goes third, a tenth and a half off the Mercedes. 16:54 Button and Ricciardo go fourth and fifth. 16:54 Magnussen slips between team-mate Button and Ricciardo. 16:54 Massa takes third from Bottas. He's 0.052s behind Hamilton and within a tenth of pole. 16:54 Roars from the crowd as Massa flies along the pit straight. 16:56 The top four are within 0.139s, then there's a six-tenth gap to the McLarens, which are half a second clear of the Red Bulls. 16:56 @MercedesAMGF1: "Turn One the difference in that lap according to @LewisHamilton." 16:56 Raikkonen sets off for his only run. 16:57 The Red Bulls and Ferraris are out, everyone else is leaving it until the last two and a half minutes. 16:58 Massa will be the last of the pole contenders to begin his final bid. 16:58 Raikkonen's lap puts him seventh ahead of the Red Bulls. 16:59 Hamilton says he has a reading showing his right-rear brake "is zero". Presumably that's temperature he's referring to, and the team tells him "all looks fine" from the data on the pitwall. 16:59 Ricciardo gets seventh back from Raikkonen. 16:59 Vettel takes sixth place between the McLarens. 17:00 Big lock up for Hamilton into Bico de Pato. 17:00 Hamilton snatches provisional pole from Rosberg by a tenth with a mighty final sector. 17:00 Rosberg takes pole back by 0.033s. 17:00 Alonso goes eighth with his sole Q3 lap. 17:01 Massa aborts his final lap after a poor middle sector. Williams will fill row two. 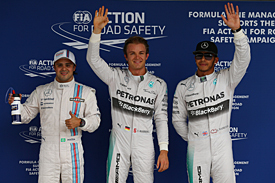 17:02 Rosberg is told on the radio that he has won the pole position trophy for 2014. 17:02 A replay of Hamilton's lock-up at Bico de Pato shows that he also briefly lost the rear-end as he tried to haul the car at the apex despite locking the inside-front wheel. 17:03 A quick thumbs-up from Rosberg to the photographers as he climbs out of the Mercedes. 17:03 Massa looks deeply disappointed as he gets weighed. 17:04 Despite his disappointment in the garage, Massa heads out into the pits to wave to his chanting supporters in the grandstands. 17:05 A smile and a shake of the hand is offered from Hamilton to poleman Rosberg, as the top three pose for the cameras. 17:10 Even @RenaultSportF1 enjoyed that pole position battle between the Mercedes-powered cars: "Wow, great pole shootout in the end, with ROS pipping HAM by 0.033sec! MAS a close third." "It's a perfect job only if it works out tomorrow. Up to now it has been going well, but of course I need to make it happen in the race unlike in Austin. "I am going for it, trying to push myself to stay optimistic all the time. Also, I know what I need to do better, so we're good to go." "It was great fun. Nico did a great lap and I lost a bit of time in Turn 10 and a tiny bit in Turn 1. It was great having to keep going out and keep fighting, and it should always be that close. I hope people enjoyed it." "I didn't use everything I could from the car because I got a lot of traffic. We could not leave the engine on so a lot of problems to leave the garage, then I lost a bit of time and everyone was improving on the last lap. "Maybe we had enough to get close. I'm very happy and I hope tomorrow is a good result for us." 17:24 Our report on qualifying for the Brazilian GP is now up, as Rosberg gets the edge over Hamilton again on a Saturday. Click here to read EDD STRAW's full report. 17:26 That's it for AUTOSPORT Live for today - thanks for joining us. We'll be back for pre-race build-up tomorrow. Then it's 'lights out' at 16:00 UK time.